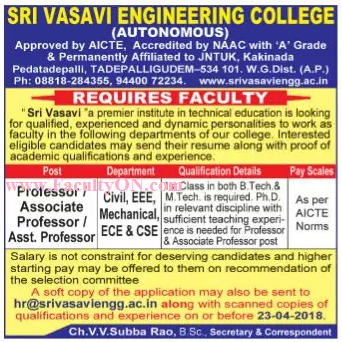 Sri Vasavi Engineering College, West Godavari, has advertised in the SAKSHI newspaper for recruitment of Professor / Associate Professor / Assistant Professor jobs vacancies. Interested and eligible job aspirants are requested to apply on or before 23rd April 2018. Check out further more details below. About College: Sri Vasavi Engineering College was established in 2001 and provides an inspiring education that engages students with rigorous academic and creative study grounded in liberal learning and promotes civic values of personal and social responsibility. Sri Vasavi faculty works with more than 2,500 students in undergraduate, graduate, and professional programs and has regularly been ranked best among the private engineering colleges in the coastal area. The intake of two UG Programmes is being enhanced and a few new courses in PG and Diploma in Engineering are being introduced from the academic year 2013-14. First class in both B.Tech and M.Tech. Ph.D with sufficient teaching experience is required for Professor and Associate Professor jobs. Pedatadepalli, Tadepalligudem - 534 101.